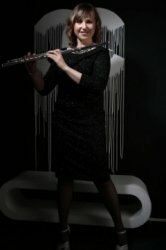 Flautist, Clarinettist and Saxophonist Amy is a multi-award-winning musician based in Northamptonshire, UK. As a freelance musician Amy’s performances have included concerts and tours with the Pasadena Roof Orchestra, Syd Lawrence Orchestra, The Matthew Herbert Brexit Big Band, London Swing Orchestra, Pete Long's Echoes of Ellington, Keith Nichols Blue Devils Orchestra, Sticky Wicket Orchestra, The New Squadronaires, Memphis Belle Orchestra and Harry Strutters Hot Rhythm Orchestra. In the theatre Amy has played for Magic of Motown, Guys and Dolls, and several Frank Sinatra Tributes. In September 2017, the Amy /John Hallam Band were voted "Band of the Year" by Rochdale Jazz Society, a title previously won with the Amy /Richard Exall Quintet in 2014. She has been part of the Best Of Young Jazz Project in 2009, 2010, 2011, 2012 and 2013, as a mentor for young people in the Worcestershire area. During the scheme Amy has worked alongside phenomenal bass player and educator Steve Berry, to inspire and teach the students taking part in the BoYJ academy. She has also been involved in educating young saxophonists in Anglesey during their Summer Residential Course in 2011 and 2012. Making music fun is what is really important, with a keen emphasis on playing by ear as well as from music. Students are encouraged to perform in a groups/ensembles between lessons to learn to art of teamwork, and to enjoy the social aspect of playing with others. AmyFrom Lesley (5/5): Amy, I just wanted to say that you have helped this older, very late starter no end! You have helped to build my confidence, always encouraging and affirming while also keeping me up to the mark! I am enjoying my lessons, my practice, my playing! Thank you. AmyFrom Ed (5/5): Yes I've made contact with Amy and had my first lesson it was a wonderful experience and I look forward to further lessons. AmyFrom Sarah (5/5): Amy is so obviously a talented and pationate musician and this really comes across in her wonderful lessons. AmyFrom Frank (5/5): Relaxed, cheerful. I am a complete beginner but Amy has patiently encouraged and corrected me. I am making progress as a result. AmyFrom Wendy (5/5): Amy is friendly and flexible in her approach to teaching and has a lovely and encouraging way about her. Thank you Amy!